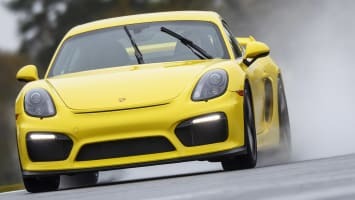 Autoblog rating for the Porsche Cayman is not available. Please check back later. 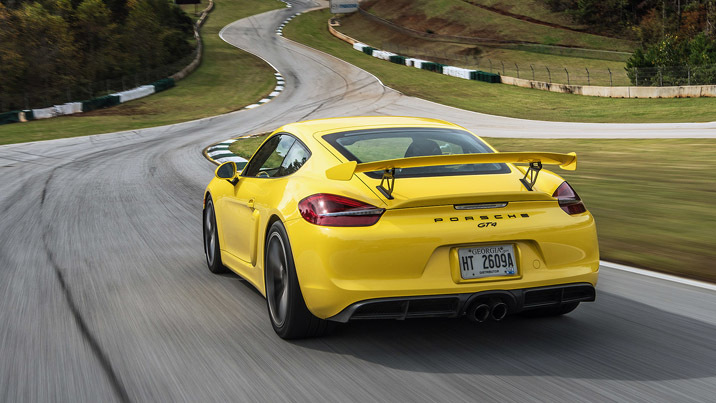 The 2016 Cayman GT4 is the sort of Porsche that purists fear would eclipse the rear-engined 911. The balance inherent in the mid-engined layout of the rigid Cayman chassis meant that it was only the right combination of horsepower and suspension away from whupping a comparable Carrera. 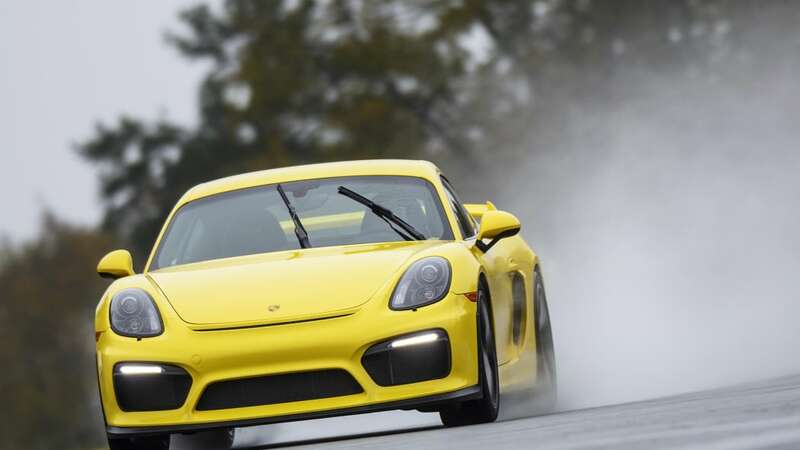 Porsche has been very careful to keep this Cayman from doing that, despite the GT4's improvements. 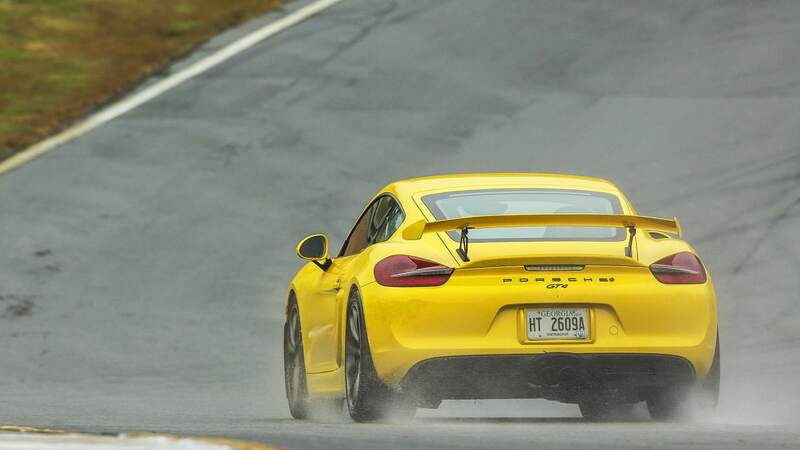 If you think this means the GT4 has been hobbled or hamstrung, it hasn't. 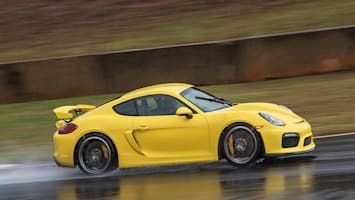 Even a sopping wet track at Road Atlanta in Georgia couldn't keep us from crowning it the brash, arrogant upstart prince of the track-toy Porsches. The company got a lot right with this ultimate Cayman. To begin with, it absolutely looks the part it's supposed to play. 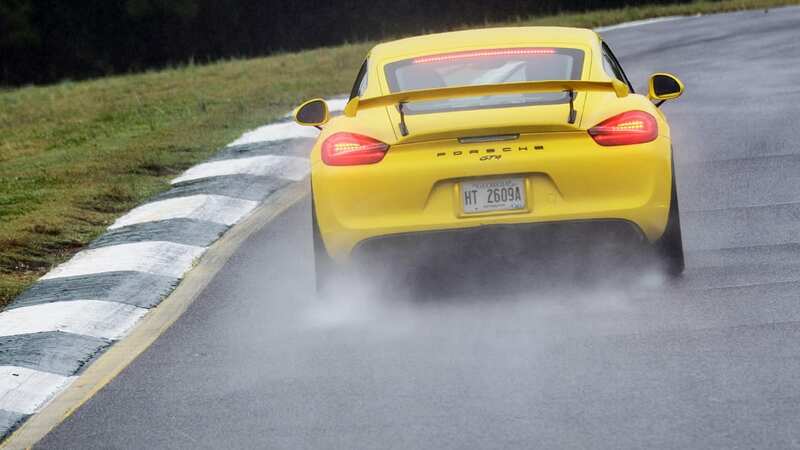 Our tester wears searing Racing Yellow paint, that large wing looming over the rear lid is standard, and rolling stock comprises huge 20-inch wheels wrapped in Michelin Pilot Sport Cup 2 rubber. The front fascia is altered for both airflow to the radiators and downforce, standard fare for a hot track-ready version. What's unusual is that instead of complicating the look with tacked-on contrivances (ahem, like the GTS's grille insert-within-an-insert), it's simpler, subtler, and more purposeful. 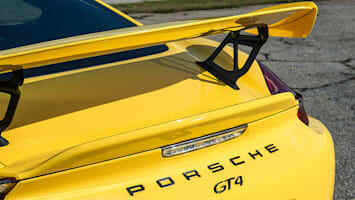 Between that front splitter and the wing, expect about 220 pounds of downforce at the GT4's 183 miles per hour top clip. Ergonomically, even with these fixed-back sport bucket seats, this car is nigh-perfect. Out back, things are more complicated but no less coherent. 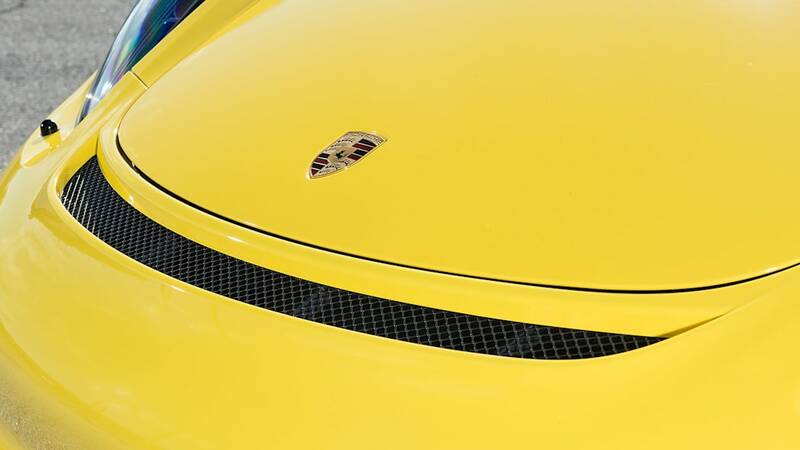 The lip spoiler that spans the trans-tailight area grows into a little ducktail, literally overshadowed by the larger rear wing. Rear diffusers are a requisite in this class, so one is present and functional. Optimized side intakes just aft of the doors cram more air into the engine, and gain a little embossed "GT4" script. 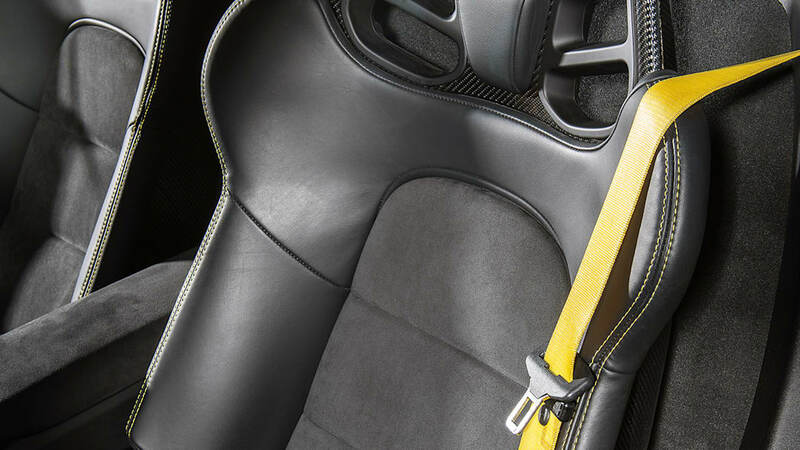 Ergonomically, even with these fixed-back sport bucket seats, this car is nigh-perfect. The slightly smaller steering wheel, perfectly sized for the application, and the smooth, precise shift action make wrangling the major inputs like an extension of your own limbs. 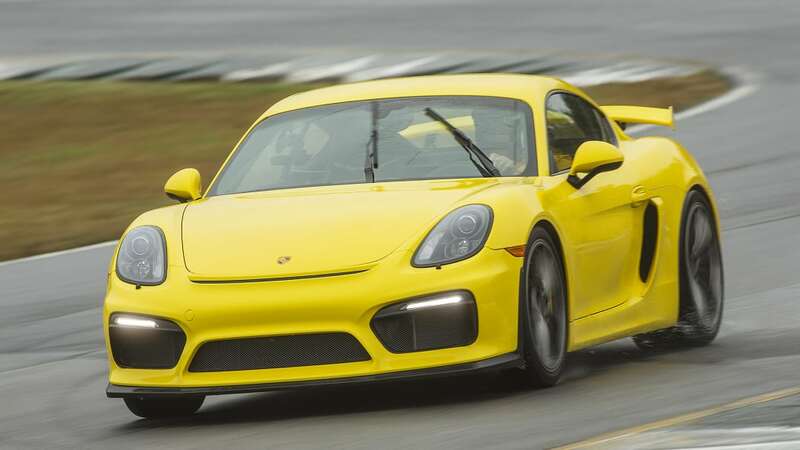 If you want to be cynical, go ahead and call the GT4 a parts-bin car. 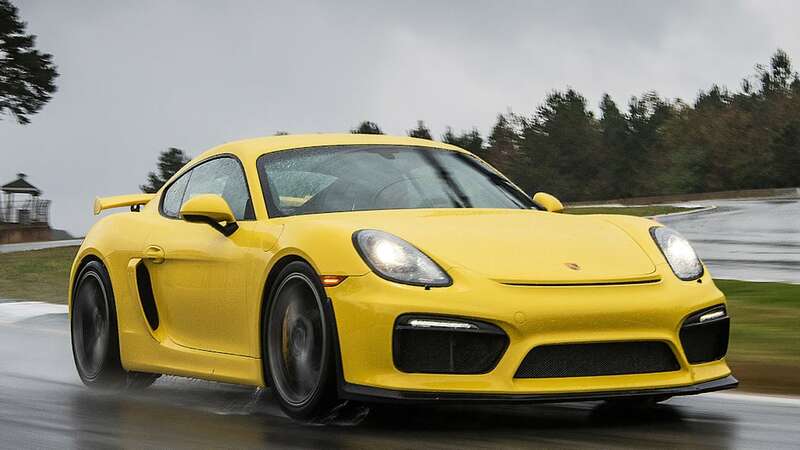 The 3.8-liter flat-six is cribbed from the 911 Carrera S, and the front suspension, steering system, and rear brakes from the 911 GT3. 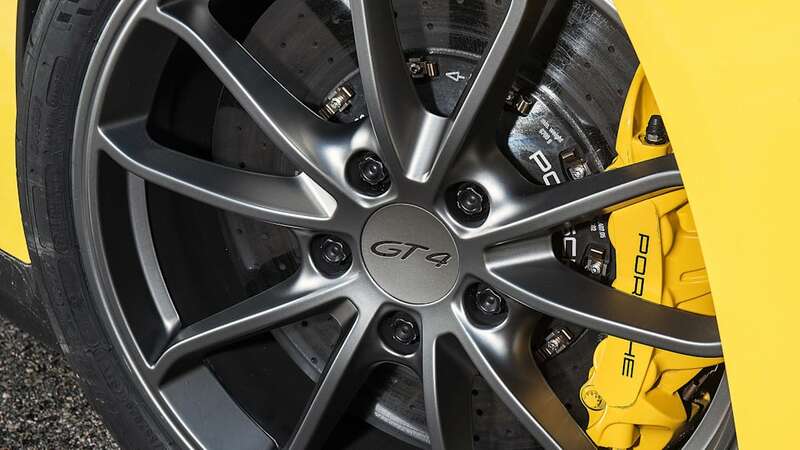 Want carbon-ceramic brakes? Then you'll get GT3 parts on both axles. 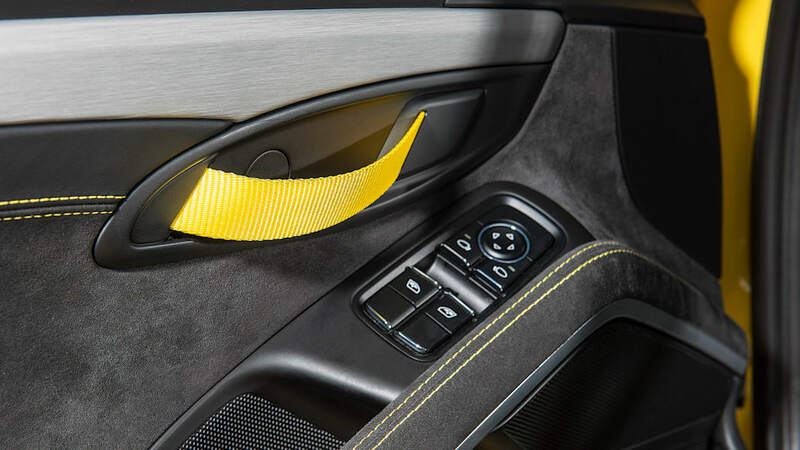 Our yellow GT4 is fitted with carbon-fiber bucket seats, and those happen to be 918 Spyder units – carbon ceramic brakes and Sport Chrono package round out the only other substantive options available for GT4. This isn't like some limited-production sports car using economy car switchgear. 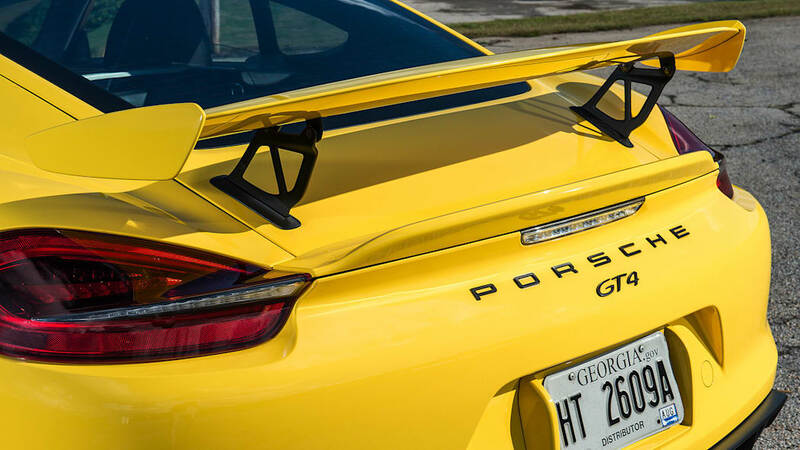 If the GT3's ridiculous multi-link rear suspension would fit, Porsche probably would have used it. It doesn't. 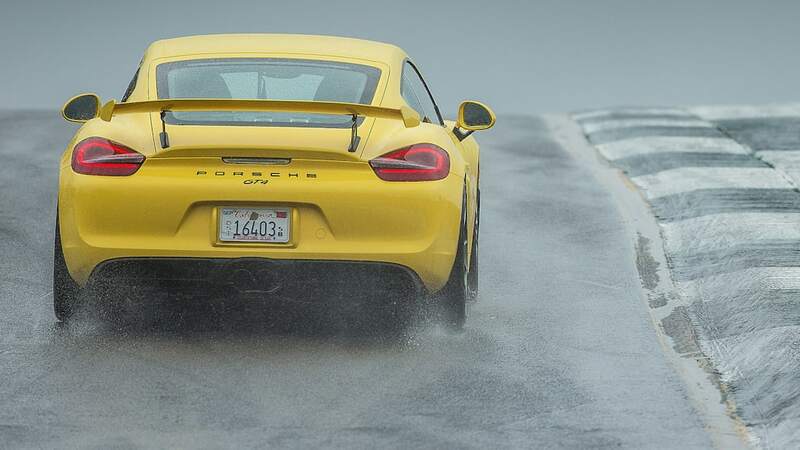 No matter – superb Bilsteins all around and the carryover strut-type rear setup are, according to Porsche, just fine for the job. 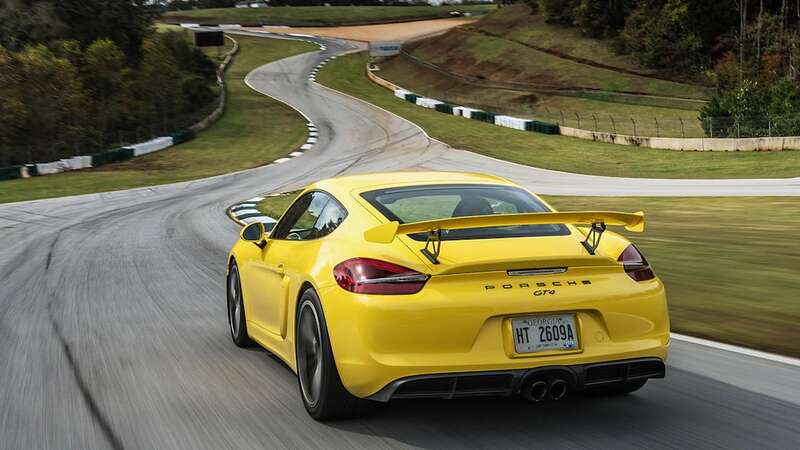 Porsche Active Suspension Management (PASM) will stiffen things up for track use, and a Porsche Torque Vectoring locking rear differential that uses rear inside wheel braking to simulate torque vectoring keeps the rear end mostly tidy. 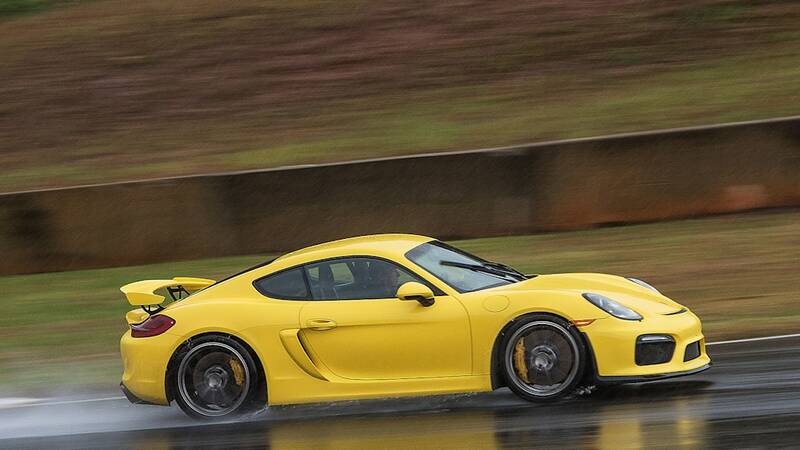 It's not all sunshine for our GT4. 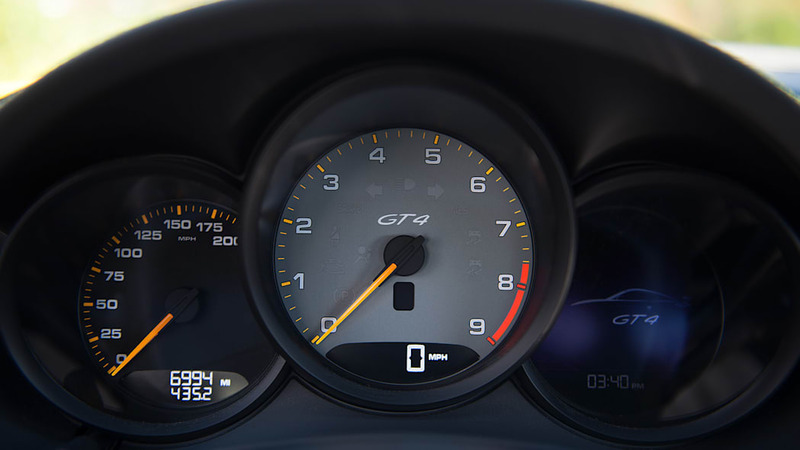 Don't expect Carrera S power output: in this application, it's been detuned to 385 horsepower at 7,400 rpm, from the 911's 420 hp at 6,500 rpm. 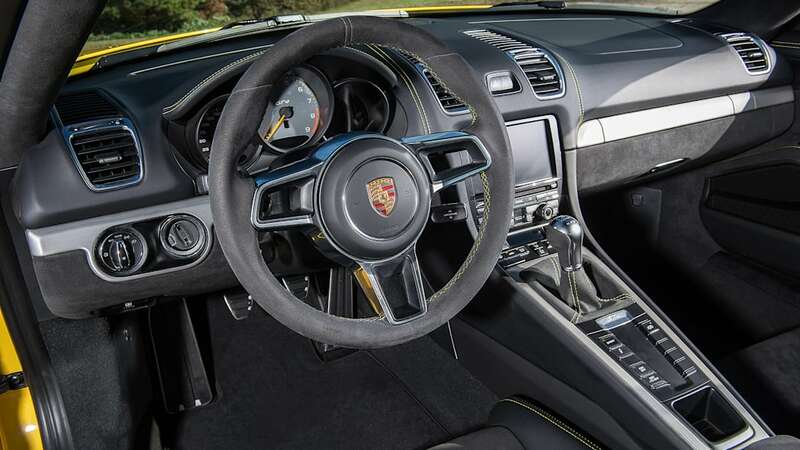 Goodies like rear-axle steering are allowed on 911 but verboten on GT4. 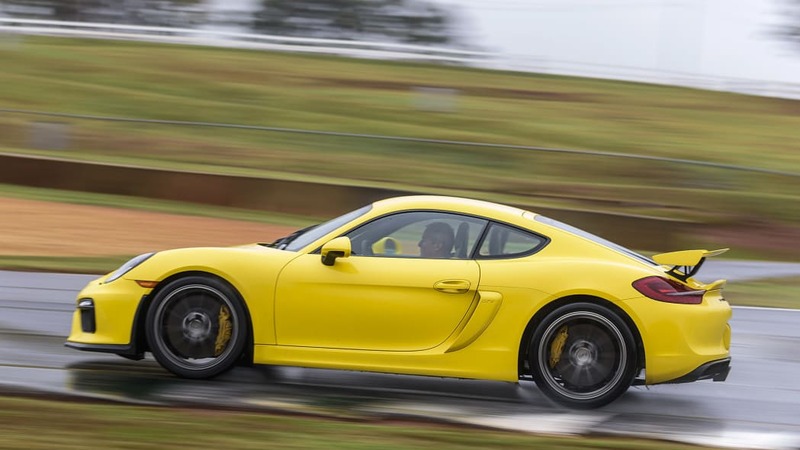 And while the GT4 is manual-transmission only – let's take a moment to loudly applaud Porsche for this – the company saddled this uber-Cayman with tall gear ratios. It takes an age to reach the powerband. 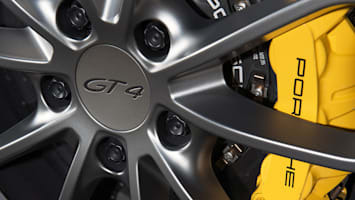 Shorter gearing would make acceleration as sharp as every other aspect, like its brilliant handling and steering. This is a shame. Shorter gearing would make acceleration as sharp as every other aspect, like its brilliant handling and steering. 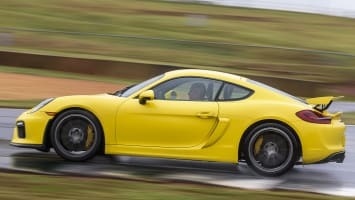 That's not to say the GT4 isn't quick. 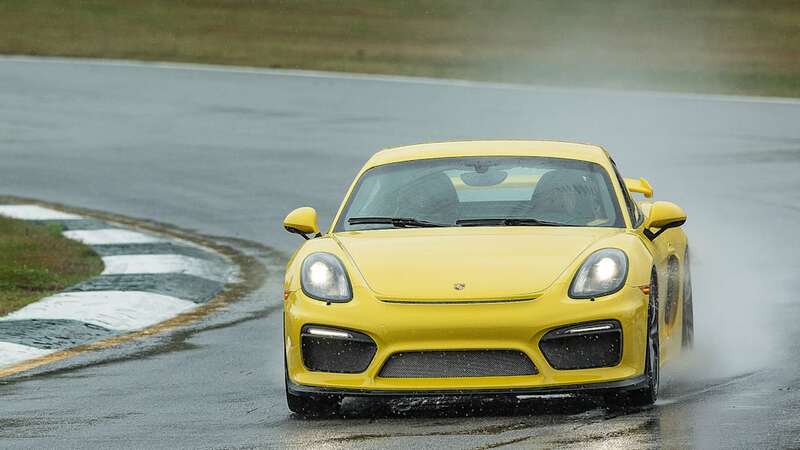 Porsche claims it'll do 60 mph in 4.2 seconds, but that must have been in the dry. At any speed, though, that 3.8 will make a lovely, guttural racket, all intake scream and baritone exhaust. 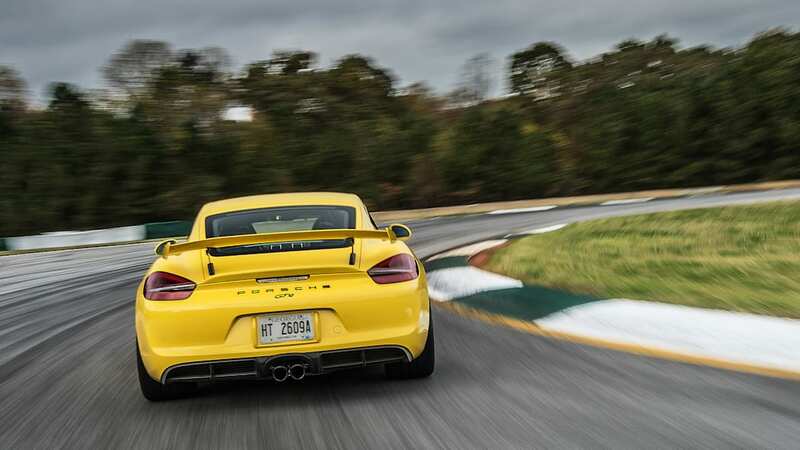 Thanks to its active Sport Exhaust, this car is loud in the best way possible. We were warned to respect the gas pedal by a guy who knows. Hurley Haywood, that legendary American endurance car racer who nabbed five Daytona 24 Hour and three Le Mans victories in a storied career (mainly in Porsches), headed up a lead-follow session. "Tickle the inputs with a feather," he told us as we slipped our helmets on, "don't hit them with a hammer." When a guy of Haywood's stature and experience says something like that, you listen. The track didn't dry out between showers, and so acceleration had to be meted out in small doses. At the first sharp right-hander, too much entry speed resulted in a bit of front-end washout. After nursing it around, another sharp right turn loomed. 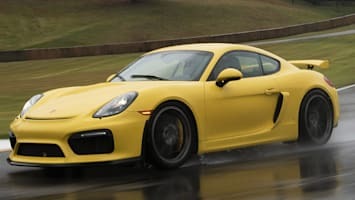 Even with the stability control nannies watching over the GT4, a whisper too much throttle and a millimeter too much steering angle on exit caused a pronounced wiggle, the one you can see in the video below. Humming a little Zen mantra ("my foot is a feather, my foot is a feather"), things went well enough after that moment. Road Atlanta has a big downhill straight on the back stretch that dives into a sharp left-right complex and then sweeps over a blind crest. Haywood did not fool around on this section, and we saw 130 mph. "Saw" is maybe the wrong word - out front, Haywood's GT4 sent up a lot of spray. 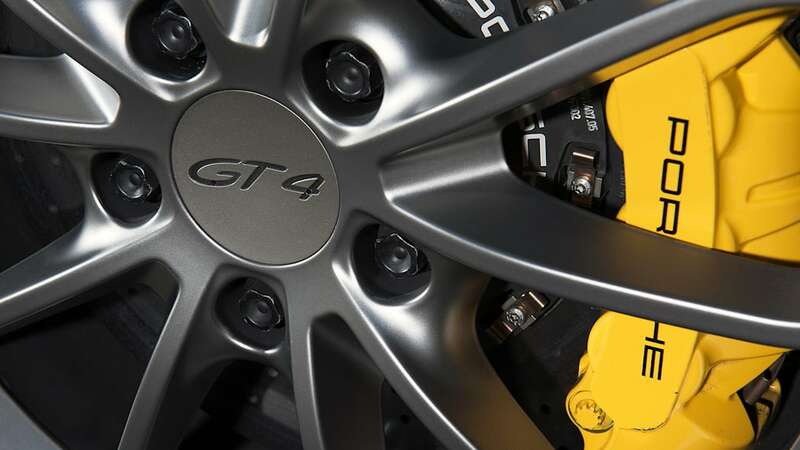 Reassuringly, the GT4's straight-line stability is very good, as is the significant and steady bite of the powerful brakes - 15-inch units all around. The rock-steadiness of the platform on the straights proved valuable every time a hand was removed from the wheel to switch on the defogger to clear the humid windshield. The rock-steadiness of the platform on the straights proved valuable every time a hand was removed from the wheel to switch on the defogger to clear the humid windshield. 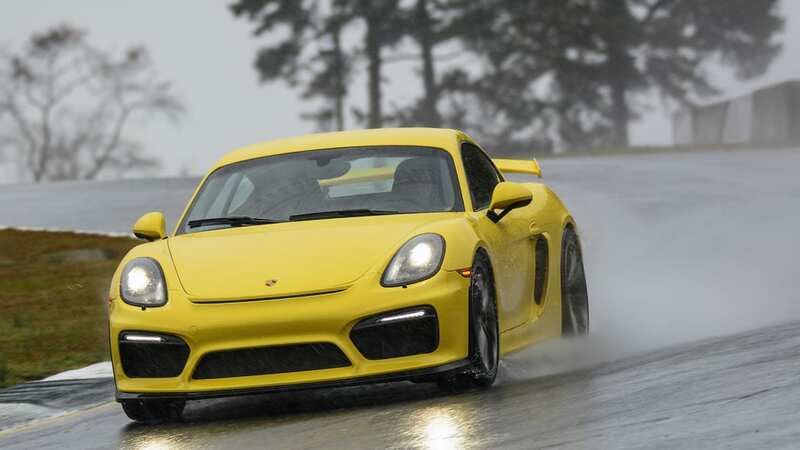 Overall, the GT4 is vastly impressive, albeit a tricky proposition in the rain. Porsche deserves massive credit for not completely neutering yaw or sterilizing the experience. The car's steering was precise and communicative; indeed, all the controls were. 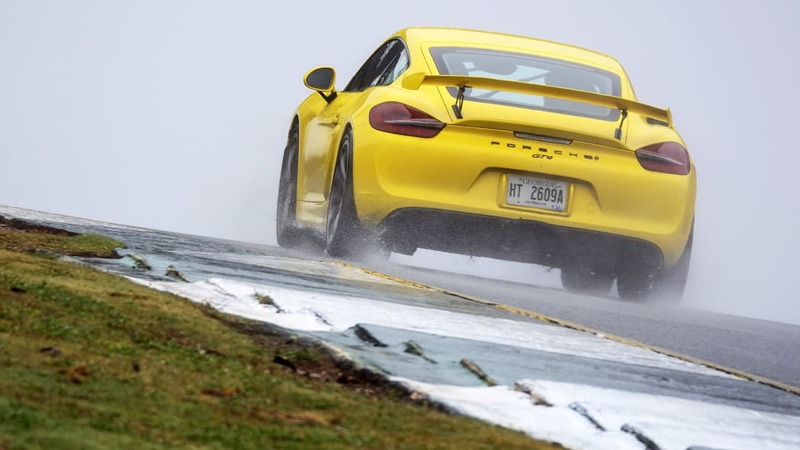 On track, the GT4 provided a masterclass in demonstrating how light inputs will reward the driver dancing on the edge of adhesion. 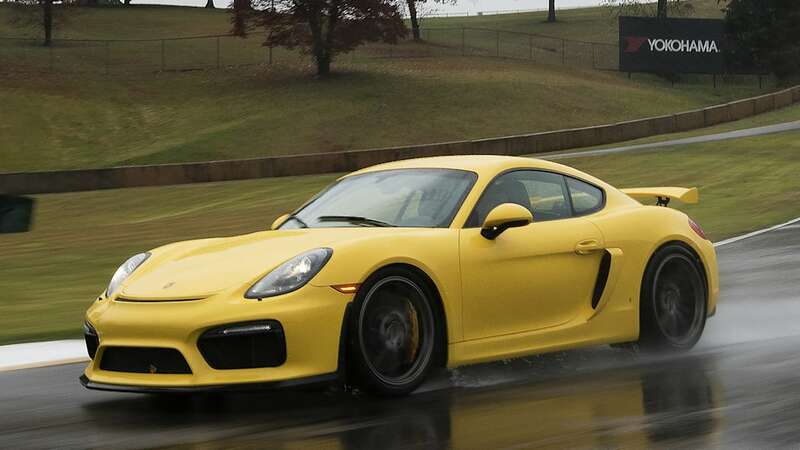 It reinforced everything we've learned about track driving, and is perhaps a better platform to draw out or encourage pure driver skill that the 911 GT3 RS we'd sampled earlier. 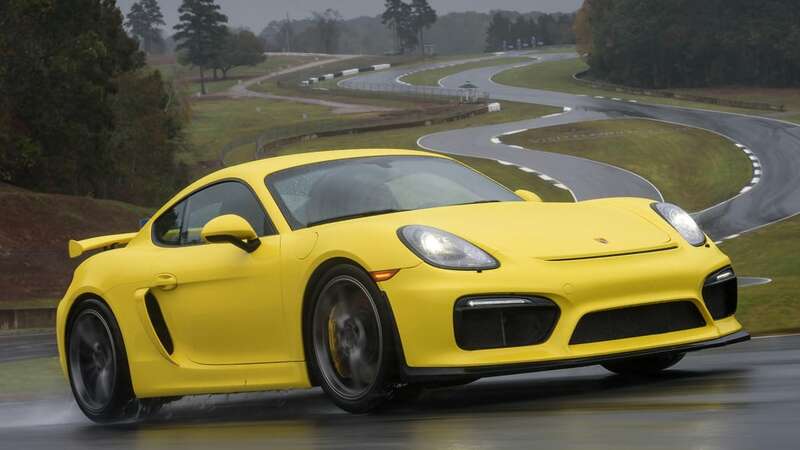 On reflection, the GT4 feels a lot like an already-excellent Cayman S – one that's been set up as a no-compromises track-day car, but without the compromises. It's comfortable. It's compliant. It's a lovely, angry little thing. 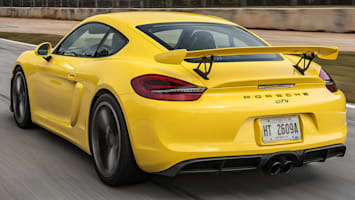 Porsche's official line on the GT4, which has been sold out in parts of Europe since right about launch, is that they're still available to American buyers. 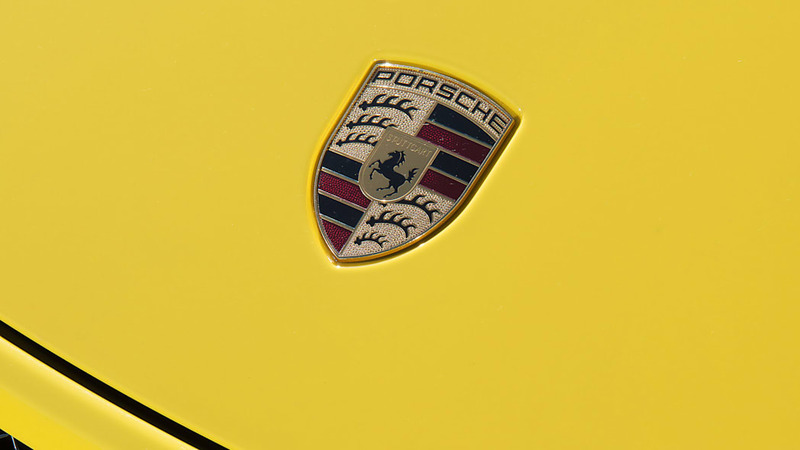 There's bad news, though: the list of interested customers is "very long," a Porsche spokesperson told us. 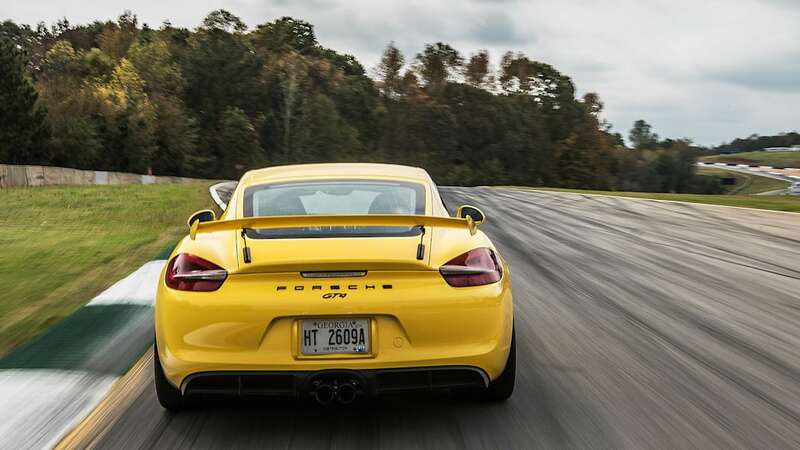 Read between the lines, and it may take a cancelled waitlist spot or several to get into a position where you can spend $84,600 or so for a GT4 of your own. 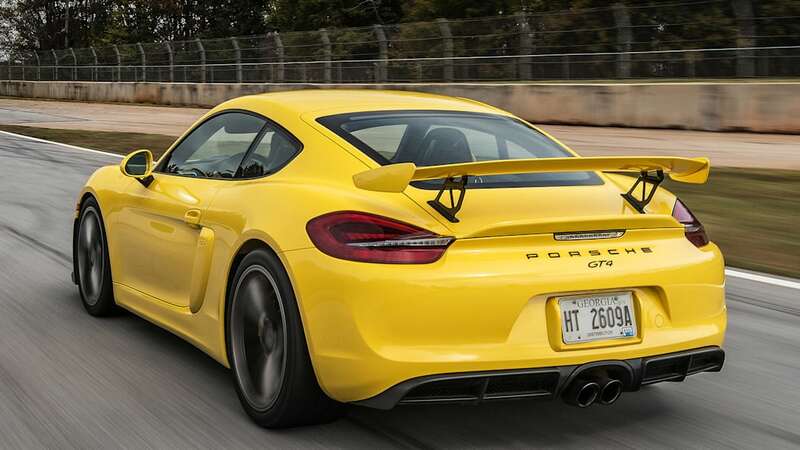 Exercise fiscal restraint in the face of expensive Porsche Exclusive options, and the GT4 is only $10,000 north of the Cayman GTS. More importantly, it's $5,000 less than the recently-introduced and turbocharged 911 Carrera, which is slower and less track-focused. 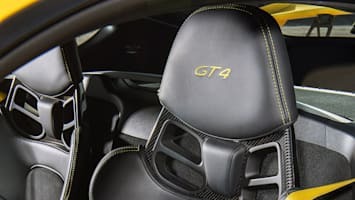 In our estimation, half the GT4's value is in its upgraded equipment and resulting driving dynamics, and half in its exclusivity. This doesn't account for the intangibles: the tsunami roar of that six behind your head, the slice-and-dice steering, the textbook definition of precise shifter action. If you can find a more rewarding Porsche for the money, go buy it.